As we are partial to a bit of food, we visited the ‘Food & Beverage Fair’ at the Singapore Exhibition & Convention Centre. The ‘Bodyshop Mega Sale’ in Hall 3 was packed with queues of people dragging enormous plastic bags of discounted creams and potions. Families staggered under the weight of books and stationery in the ‘Popular Expo Sale’. Loud music turned the rather drab atmosphere of ‘Robinsons Expo Sale’ into a bit of a disco. We fought our way through the crowds like migrating salmon until a strong smell of hotdogs and dried fish indicated we had reached the ‘Food & Beverage Fair’ in Hall 6. There was barely room to move as we went with the flow around the stalls that were fronted by ladies handing out samples on sticks or in tiny paper cups while others squealed though microphones. Hundreds of tables and chairs in the middle of the room were occupied with diners, some of whom appeared to be staying for the day judging by the quantity of gathered food. Staff with barrows that weaved in an out of the tables barely had time to clear the debris before the next group descended. 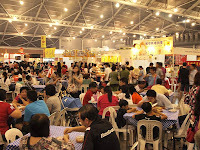 We continued round the stalls which featured: crispy fish skin crackers, tummy flattening pants, Nyonya rice dumplings (very popular), micro washing machines, micro sewing machines, grains to reduce swelling, thermal flasks, shark’s fin soup, dried fish (couldn’t see it but it was definitely there somewhere), fluffy blankets, juicing machines, luncheon meat, skin treatments, date juice tea, ozone detox appliances, woks (to ‘flavour up your food’), seaweed omelettes, seaweed jelly, bak gua (unnecessarily sweet), pork or chicken floss (handy to sprinkle of just about anything apparently), durian puffs (stinky), Table Mates (never leave the comfort of your sofa), almond beverages, nutmeg creams and treatments, foot spas, intestinal defender tonics, cheesy-puffs, rocks (ordinary rocks as far as I could see), Scent Kings (to effectively repel insects and prevent breeding), laksa, fried chicken, bao & dim sum, satay, brown rice tea, pizza, otah, Shepherd’s pie, kueh pie tee (pastry shells filled with spicy vegetables and prawns), sambal and curry puffs. The strange thing about the fair was that we were the only Westerners in the hall. Why should that be, particularly on a public holiday? Very odd.